Child sponsorship is an incredible thing. My family sponsors 5 precious children (I sponsor 2) that I never would have known existed if CRF had not begun projects in their villages. The statistics of global poverty and the orphan crisis are so vast that it’s truly impossible to wrap your mind around the numbers. People empathize with people more than they do with numbers, which is why I tell stories of individuals more than I share the statistics. When you choose to support a child in a developing country, that child becomes the face of the orphan crisis to you. And when you see this child grow and transform and gain literacy, you see extreme poverty fought and conquered on very real and personal terms. For me, when I think of the orphan crisis, the face I see is my Naomi’s. The first time I met my sponsored daughter, my world froze. She was real. She was huggable. She was beautiful. And to see her world of struggle was to see my own collapse around me. It’s like everything you know about your world is a lie when you are forced to face the truth of poverty. Because in reality, there are millions of children like my Naomi. Her story caused tears to stream down my face because I saw how she lives and what she’s lost and because I love her. And there are so many in her shoes. I think about God’s intimate love for every child on this earth and how his heart must break daily on account of the 132 million orphans who are like my beloved Naomi. And my heart has broken a thousand times over for her story. Why don’t our hearts break more for what breaks the heart of God? Child sponsorship forges a relationship that never would have existed otherwise—two people living across the globe from one another who love each other like family. It’s precious. It’s a Christ-like model. Sponsorship forever changes the lives of both people involved. Today we will talk about poverty and education. The most important tool to fight poverty is education. When you have entire communities of people who have never learned to read or write, who have never been taught trades to provide for their families, and who don’t understand AIDS and disease prevention, you’re faced with a cycle that is unstoppable until some degree of education takes place. 32 million children in Sub-Saharan Africa alone are completely uneducated. This is more people than the entire population of Texas. Globally, 757 million adults lack basic literacy. Two thirds of these adults are women. According to the Global Education Fund, 8.5% of Kenyans complete high school. Less than 60% enroll (with a 41% attendance rate). School tuition is incredibly overwhelming for a family in poverty. Public school in Kenya is “free.” By this, I mean that students must pay for uniforms, books, exams, and other “fees” that cover the cost of teachers’ salaries—and many families aren’t equipped to afford this. When a family makes less than $10 a day (80% of the world) and has multiple children who want to go to school, this “free” education quickly becomes unreachable. And high school is a much higher expense. When you sponsor a child with CRF, you are covering these impossible costs. $35 a month might triple a family’s monthly income—and it’s going directly to the needs of your child. When you educate one student, you’re empowering someone who can make a tremendous impact on an entire community. Naomi is an orphan on Mt. Elgon. Both of her parents died from AIDS, leaving their two young children in destitution. Naomi and her brother Isaac went to live with their grandmother, Chedras. Elderly, illiterate, and widowed, Chedras has no trade to help her provide for these two kids. One year ago, this family lived together in a one-room mud hut with a grass-thatched roof. After a brutal rainy season, the house was literally falling in around them. They had no access to clean water, so Naomi was infected by parasites that had contaminated the family’s drinking water. The medicine that could make Naomi feel better cost $1, but they could not afford even that. Naomi wished she could afford to go to school more regularly. Her dream was to become a nurse one day so she could help the sick people in her village. 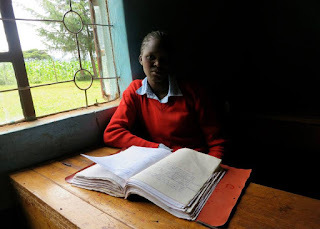 After she was sponsored, Naomi thrived. She now wears a crisp orange uniform and isn’t sick any longer. She has access to clean water at school—and there is a water well in her village now too! She is on a nutritious diet for the first time in her life. Naomi writes letters to her sponsor almost every month because she is learning how to read and write. And best of all, Naomi knows and loves Jesus. My biggest concern for Naomi was when her house would eventually cave in. When this day came, Naomi and Isaac would have to move into an orphanage because they would have nowhere else to go. This family is small, but they have each other. To be separated would be to strip Naomi from what little family she still has on this earth. For Christmas, my dad gave Naomi’s struggling family a new house with an iron sheet roof that will hold up through many more rainy seasons. I am excited to see this home with my own eyes in a matter of days. There are so many amazing CRF projects that I could tell you about, but my final highlighted program for my 40 days of stories is the Kapkirwok High School. This school is located at the very top of Mt. Elgon. The war that left behind so many orphans at Milton Simotweet has shattered the lives of most of the students here. Some were child soldiers. Most saw the brutal, traumatizing deaths of their entire families. There are currently 24 sponsored teens on the top of Mt. Elgon and one still on our waiting list, as he has been for months now. It’s difficult to find sponsors for these older students, even though they have some of the greatest needs. I’ll return to Kapkirwok this summer for the first time in three years. Its’ a difficult journey to make up the mountain without any actual roads, so most of the team will stay behind in the ever-delightful Eruli program and help construct a library there. There are many heavy hearts at Kapkirwok, so I am thankful the CRF director there is a Christian counselor who can walk with the students through their emotional hurts. Pray for the kids at Kapkirwok High School. The school is always struggling due to the extreme poverty of the community—and it has shut down more than once when violence in the area keeps anyone from leaving their homes. Please pray for my time on Mt. Elgon. Americans don’t get to go often because of the long and complicated journey that it takes to make it up the mountain, so I am praying that my time is both encouraging to these students and teachers as well as fruitful and productive. A service project our team will be doing this year is building a semi-permanent house in the Nyalenda slum. By semi-permanent, I mean an iron sheet roof and foundational logs to strengthen the walls, but clay insulation and floor. The cost of a 2-room house like this is $600. Last July we got to take part in building a home for an elderly widower named William. In his old age, he had begun to get dementia and could not maintain the upkeep of the hut where he lived. It was falling apart all around him. Because we obviously didn’t know how to build a semi-permanent house, our team helped to flatten the foundation of William’s new home, clearing away the trash and weeds while the construction workers began. Later, we helped them lift foundational logs and plaster mud onto the walls—the rest of the time, we got to know the community while we watched in fascination as William’s house was built by the professionals. This July we will participate in the construction of another house in Nyalenda. A 16-year-old girl traveling to Kenya for the first time raised the money for this house. We don’t know yet who will live there. There is something special about taking the time to get your hands dirty to plaster sod on a wall or remove old batteries from a dirt floor. We aren’t constructing the entire house—and so we shouldn’t—but having a small part in something transformative to a person like William is a blessing to us too.